Another prized telescope in my collection is the diminutive yet deceptively powerful C5+, a Celestron 5-inch f/10 Schmidt-Cassegrain Telescope (SCT) on an eye-catching single-arm fork mount with a servo motor drive powered by a single 9v PP3 battery. This instrument made its debut in 1992 and production carried on for another seven years until the fully-computerised NexStar 5 appeared on the scene. Mine is one of the later models since it has Starbright optical coatings and a declination motor, also powered from the battery in the drive base via a coiled black cable. What makes a C5+ so special? 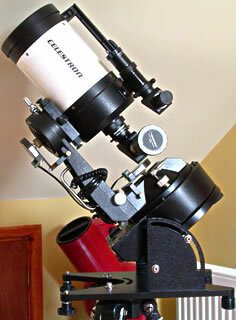 It's partly because this was about the time that Celestron was producing some of its best 5-inch SCT optics. NASA also gave the 'scope a huge seal of approval by using the all American-made 'scope on a number of Space Shuttle missions. With a tube assembly just 28cm long, 15cm in diameter and weighing around 3kg, it strikes a nice balance between portability and having a large enough aperture to do useful work. The optical tube of the C5+ is attached to the fork arm by a dovetail bar, so it may be easily removed should you wish to mount it on a photo tripod (though do note that the dovetail size is not quite the same as the Vixen specification). I eventually fitted an Orion right-angled erect image 6x30 finder and Lumicon Sky Vector 1 digital setting circles to my C5+ which has made an already tremendously useful grab-and-go instrument even more versatile. Knowing that I have an accurate battery operated drive (which, incidentally, lasts several tens of hours) and a battery operated computerised pointing system means that I don't have to carry a rechargeable power pack into the field. I usually leave a Celestron 8-24mm zoom eyepiece in the dielectric diagonal, too. So, there you have it — my portable observatory!